Oh, look a cheap version of an iPad! Erin, 31 Aug 2014Xiaomi devices always have non-removable battery. Dealbreaker for me to avoid any Xiaomi products.Do you know any tab with removable battery? lol you're too funny! Xiaomi devices always have non-removable battery. Dealbreaker for me to avoid any Xiaomi products. Nice tab. Two things that need improvement. Back cover and LTE version. Would become the best tab. I think there is a lot of dispute on the wrong direction. 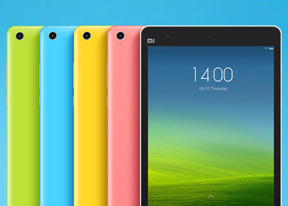 Mi Pad imitates more the Amazon model with Kindle tablets and smartphones. That is, it provides a heavily customized UI based on Android but with certain restrictions. The whole user experience pushes the owner to consume content from Baidu marketplace and service as Amazon does with its own platform. The problem in both cases is that, even though the hardware specs are top level, the user experience is inferior to pure Android. In case of Mi Pad, things are worst since MIUI customization is half-baked and puts a lot of restrictions to end user. Currently, MIUI version (v5) is smartphone-oriented and lacks a lot of features required on tablet space. Hopefully, this gonna get better in a few months when MIUI v6 arrives. At the other hand, I regard lack of HDMI port (in any form) or Miracast as major omissions for a tablet with such powerful media character. First with K1 ?, 29 Aug 2014"This is the first commercially-available device to be powered by Nvidia's Tegra K1 chips... moreMipad launched in June 15th. Xiami is fooling the consumers with their cheap copy-cat products. By the time you start using it, they will change the model and you will not have any warranty support and your money is wasted (just now they did it with MI3 phone). "This is the first commercially-available device to be powered by Nvidia's Tegra K1 chipset"
How about Nvidia Tegra Shield tablet which is available in USA since July and in Europe since 15 August ? Nvidia Shiels has also a LTE version available in USA already. When GSMArena is going to review that tablet ? AnonD-285813, 29 Aug 2014Even those chinese phone and tablet manufactures are coming with better desgins and specs than... moreThe technical specs... yes. Not sure about design though. Even those chinese phone and tablet manufactures are coming with better desgins and specs than Apple. I dont get it. This is just another Android device so it should only be look at from a value perspective, that is, how cheap it is for what it delivers. Same for any Android device because they are basically the same. So only buy a cheap Android device to do just what you what and dont bother with all this specs race. Get cheap and dont pay way way over the top. Not worth it. bobby21, 28 Aug 2014This is a bad iPad mini ripoff. Wrong. What's right is, iPad mini is worse than this ripoff. it doesn't support miracast,only wifi direct is supported right ?? "Best of all, the Tab Pro 8.4 costs even less than the Mi Pad 7.9 or the LG G Pad 8.3." What's this..? Pro cost almost double the Mi pad.. R u sure abt ur conclusion..? This is a bad iPad mini ripoff. Thanks. It is great that you are reviewing Xiaomi’s phones and tablets and I can read their reviews on your website, but I have a feeling that the price comparison in not fair. I own Samsung Galaxy Tab Pro 8.4 I bought it 2 weeks after it appeared on the marked. It was the most expensive 8” android tablet on the market (LTE version) (though wf-fi version was not much cheaper). MiPad is a fresh device and it is much more power full than Lg G Pad 8,3 and comparing prices here is like comparing prices of LG G2 vs SGS 5.
jerry, 28 Aug 2014Sure... It might have taken a lot of design cues from the ipad from its hardware to how the so... moreDude, it's a RIPOFF the iPad, ofcourse they had to. AnonD-286309, 28 Aug 2014I'm glad you like my points. I try to me as rational as possible. Most Galaxy Note owners are.... moreI never said i didnt like it. I actually own Galaxy Tab S. They are kinda similar. But im just saying its not that good like for example Nvidia Shield tab or the Xperia Z2 tablet(only sony device even worth checking out)..